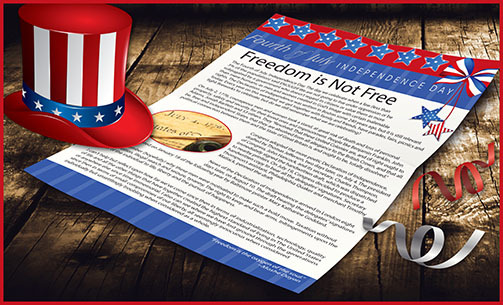 July 4th Independence Day 2016 - Peabody Engineering & Supply, Inc. The Fourth of July. Independence Day. The day we celebrate when a few (less than 3% of the population) said ENOUGH! We are not going to live under oppression or be subjugated by a government who doesn’t regard its citizens or value them as more than mere humans; as men and women created in God’s image with certain inalienable rights. The Declaration of Independence was written in Boston some 240 years ago, but it is still relevant today. Every year on this weekend, we get together with family and friends, have parades, fairs, picnics and light fireworks to celebrate, but do we still remember what we are celebrating? On July 2, 1776, courageous men and women took a stand, at great risk of death and loss of personal property, safety and security for their loved ones and imprisonment. People like Benjamin Franklin, John Adams, Josiah Bartlett and 53 others. They “Resolved: That these United Colonies are, and of right ought to be, free and independent States, that they are absolved from all allegiance to the British Crown, and that all political connection between them and the State of Great Britain is, and ought to be………..